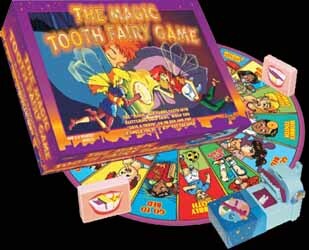 The Magic Tooth Fairy Game is not just a game that can be enjoyed by the very young. 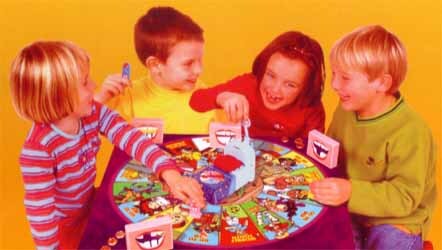 Grown-ups can also delight in watching their offspring get totally immersed in this fun game. However, while adults can still enjoy this, as far as children are concerned anyone older than eight will probably find this a bit too babyish. That's worth keeping in mind if you are planning to buy this for your own family. Because of this, it means that you are not going to get years and years of enjoyment out of it. But, as a short-lived entertainment device for keeping the little ones amused on a rainy afternoon, it does the trick. A lot of thought has gone into the design of this game. The fact that the game developers bothered to come up with a neat little bed. Put your tooth under the pillow and when you lift it again the tooth has been replaced by a gold coin. The board is also bright and eye-catching with cartoon images of children doing different activities. Actually there was, oddly enough, an almost manga quality to some of these illustrations. In short, this is a well priced game that will only really be appreciated by the very young.